- Definition : An area of abnormal attenuation or signal with septations and cavitations. Density of the area or signal intensity is same as that of csf with septations and cavitations which are better seen on MR than CT.
- Histopathologically characterised by destruction of brain parenchyma, presence of multiple glial septations surrounded by astrocytic proliferation. - Etiology can be any severe insult like infarction, infection or trauma. Involvement may be focal or diffuse, depending upon etiology and severity of involvement. - Cause of the injury can be presumed imaging wise depending upon the area of involvement. Encephalomalacia secondary to arterial infarction will be wedge shaped and confined to particular vascular territory. 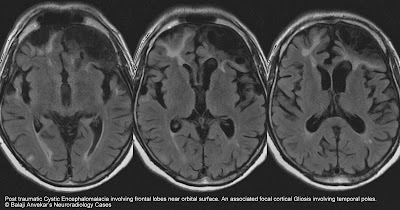 Encephalomalacia secondary to hemorrhagic venous infarcts commonly involve and temporal and parietal lobes. Hypotension and hypovolumia will affect cortical border zones. Trauma commonly involves orbital surface of frontal lobes and temporal poles. - But sometimes imagingwise it becomes difficult to comment about its cause, in such cases review of previous history or CT,MRI report is very useful. 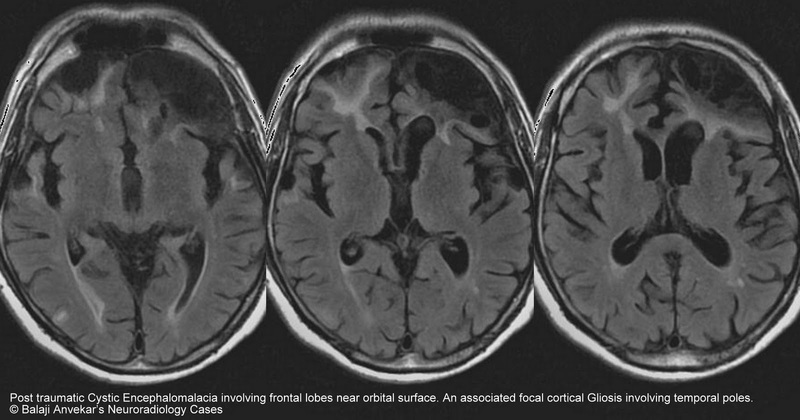 My last MRI with and without contrast showed the presence of encephalomalcial and a glial cyst? What could this mean? I've had previous and current CSF leaks and trauma to my frontal lobe but this glial cyst isn't something I've heard of until now?